Yes, right now there’s just this laptop, me eating fruit crisp in the rain, me in my lovely polka dotted pajamas. Aah, the romance of it all! The romance of indulgent fruit; the romance of knowing that there is one more dish of mango crisp in the fridge I can sneakily eat in the middle of the night like Nigella. In my pajamas. I’ll stop being a floozy. But this is some seriously good crisp. Or crumble. Or streusel-topped fruit. Everyone has their own definition of what a crumble, crisp or cobbler is; I was planning on calling this a crumble; but since I was not adding oats, I stuck with crisp. Also because the topping is quite crisp. 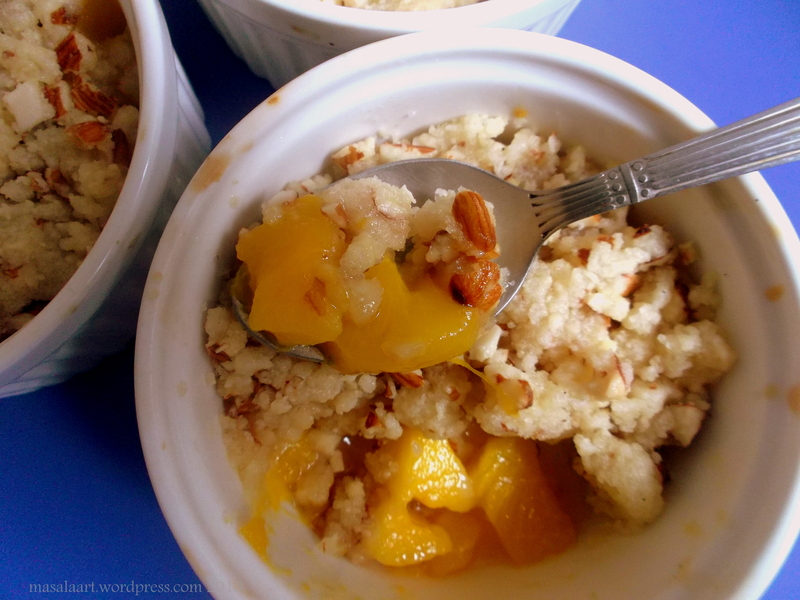 This is an easy and quick dessert to make, and there is actually no cooking involved- just some chopping of mangoes and combining the flour, sugar, butter and almonds in a food processor or by hand. Assemble it, pop it in a pre-heated oven for 10 minutes and voila! You’ve got yourself a pretty dessert that can hold it’s own at a phancy tea party. Pre-heat oven to 220 C and butter four ramekins and keep aside. 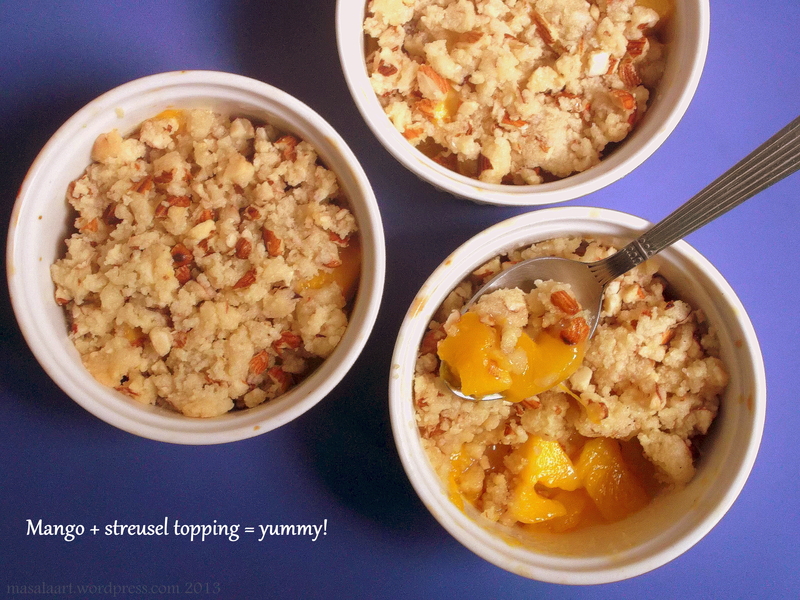 Fill the bottom of the ramekins with the chopped mangoes, top with the streusel topping. Bake at 220 C for 10 minutes or until the top appears to be pale and crispy. The mangoes soften and release their juices so it’s almost like biting into a warm pudding once you are past the crispy top. A little fresh cream makes it even better! And that’s the beauty of it: you require so little time and effort; yet by getting your floozy on and calling this dessert “mango streusel pots,” you can create a phancy illusion. Love mangos. Thanks for sharing! This looks like heaven!! What a brilliant combination of my two favorite fruits!! Thanks so much! Until I started experimenting, I didn’t realize how much you could do with mangoes as a dessert. They are better for more than smoothies, for sure! 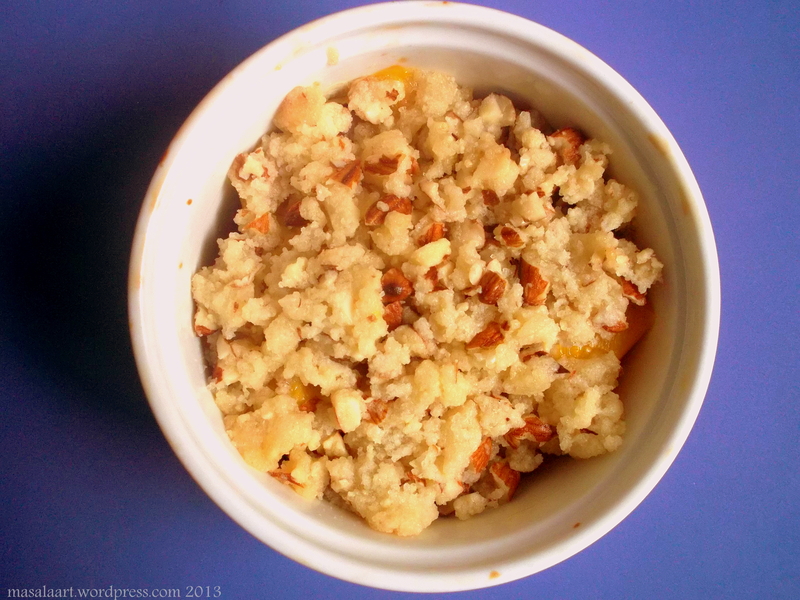 Thank you so much Meenakshi for mentioning my apple grape streusel as an inspiration! You are most welcome Daniela! I loved reading that post and how you come up with simple yet beautiful dishes. How long did you live in Delhi? It is one of my favourite cities! I lives there for 6 years, from college onwards.